It's one thing for politicians to say they support transportation and logistics investment, but it's another thing for them to take action. Here are five states and government leaders going above and beyond to influence economic growth. Watching Brad Little engage with local business owners is edifying. He's amiable but direct, accommodating to questions and succinct in his answers. These are the kind of attributes you might expect from a cowboy—which he is. Little is a third-generation Idahoan and rancher by trade. He's also Idaho's Lieutenant Governor, and chairman of Governor Butch Otter's task force on modernizing transportation funding. His experience and demeanor serve him and Idaho businesses well. It's also a telling representation of how the state values economic development. Idaho isn't alone. Many other states go above and beyond to support transportation and logistics infrastructure development and legislation that facilitate business retention, investment, and expansion. While partisan politics, demographics, and geography can typecast and divide, leadership and vision have a way of elevating some above the rest. Here are five outstanding examples. Utah is a transportation oasis that criss-crosses the Rockies and joins north and south. Four major Interstates—I-15, I-80, I-70, and I-84—connect through the state. Union Pacific is the rail freight operator of choice, with more than 1,400 miles of track, and Delta operates its western hub at Salt Lake City International Airport. 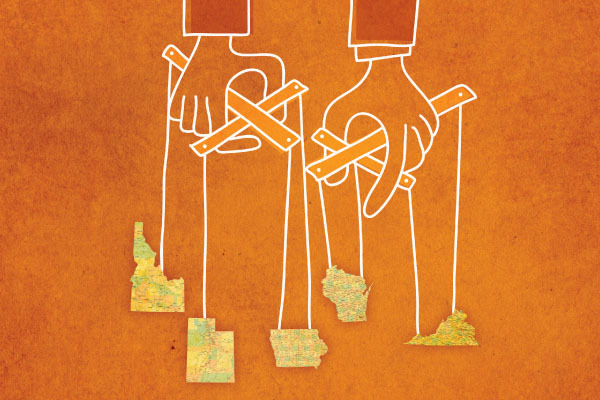 But Utah's most interesting distinction is its broadband infrastructure, which has built up along its well-traveled transportation corridors, explains Michael Sullivan, communications director, Governor's Office of Economic Development. "Our broadband infrastructure is the fastest in the West, and second in the United States to New York City," he says. Enforcing its reputation for "connectedness," Utah's IT competencies have created one of the most intelligent highway systems in the country. Utah Department of Transportation (UDOT) has been equipping all major road systems in the state with fiber-optic cables that send information to a sophisticated computerized system. The system allows UDOT to monitor and manage traffic flow and communicate information in real time. In addition to legislative changes, the Wisconsin Department of Transportation (WisDOT) is also exploring ways to provide better services—from locating transload facilities to buying and renovating outdated rail track—to coordinate intermodal freight movement. "Over the past several years, we have been actively acquiring rail lines that are important to manufacturers and mining operations, but have become financially impractical for shortline railroads," explains Steven Krieser, executive assistant, WisDOT. "We rehab those tracks, then lease them back to the rail operators." It's a win-win situation for small railroads that don't have the capital resources to invest in and maintain infrastructure, and local manufacturing and mining interests that depend on rail access to remain viable. A relatively new natural resource that is in hot demand is also adding to the growing need for rail services. "Wisconsin's geology is favorable to the formation of frac sand, which is used in oil and mining processes," Krieser says. "We have enormous reserves here, so it's a growing industry. Frac sand is also very heavy per volume, so rail is the ideal way to transport large shipments." Hoosier EnergyRinchem Company, Inc.Port EvergladesElectriCities of North Carolina, Inc.